The criteria for participation in this small pilot program include living within 200-miles of Santa Rosa and veteran status. At this time, Canine Companions does not train dogs to work with individuals who desire support for PTSD outside of the context of the pilot program. Q: Is there a fee to receive an assistance dog from Canine Companions? No, Canine Companions assistance dogs and all follow-up services are provided free of charge to the recipient. Students are responsible for their transportation to and from the regional training center, their meals during Team Training and depending on the training center in your regional area, the cost of staying in a hotel. 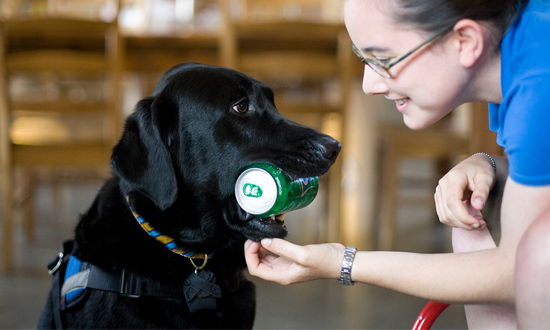 Canine Companions uses Labrador Retrievers, Golden Retrievers, and crosses of the two breeds. Canine Companions assistance dogs are highly trained to perform a limited set of practical tasks geared towards assisting individuals with physical disabilities lead more independent lives. Although our graduates find an incredible depth of emotion in the bond between them and their dog beyond just the working tasks, Canine Companions does not place dogs with individuals for the primary benefit of emotional comfort or social support. 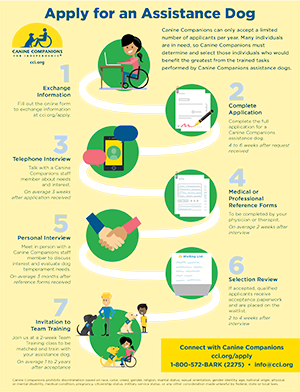 Canine Companions has a comprehensive and interactive application process. Before we begin, we first exchange basic information to determine whether the program will be a good fit. At each step of the application process, experienced Canine Companions staff review an applicant’s need and qualifications to determine whether or not the applicant will move on. Click on the graphic below for more information the application process.